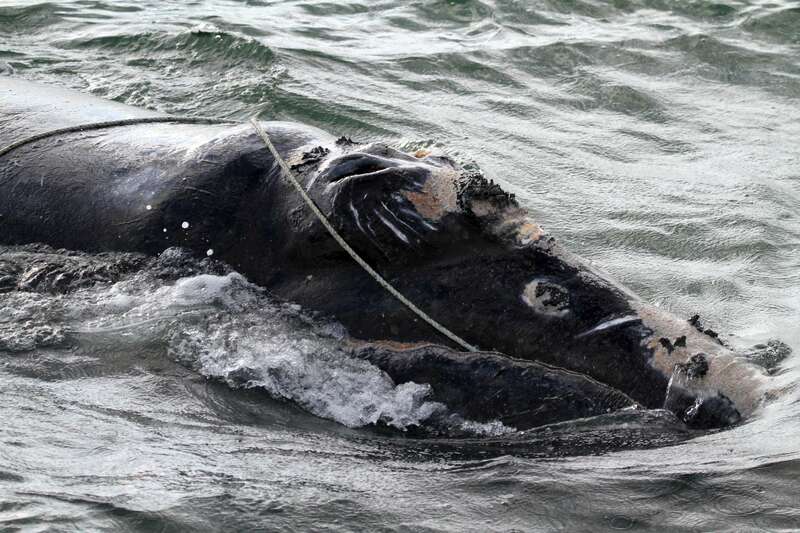 The ropes saw through their skin and blubber, causing infections. They also cause huge drag, preventing the whales from feeding. There are only a couple of hundred right whales left in all the world, so losing any single one is a tragedy. Marine biologists have tracked and named most of them. They are constantly attempting to free them from the tangle, but it’s nearly impossible. The whales are easily spooked, so you can’t just row up to one. If they turn, they can easily smash you and your boat. Moore has been following them for decades. He finally came up with a solution – a tranquilizer dart with a foot-long-syringe that’s fired by a rifle. It takes 60 cc to knock out a 7-ton whale, when a few drops of the stuff would kill a person. They tried it on a two-year-old female, Bayla, in January 2011, and it worked. She lay calmly in the water as divers went over and cut off as much rope as they could. It was too late. Bayla was found dead a few days afterward, infected and emaciated. Part of the rope was so embedded in her snout that the flesh had grown around it. Moore had to do the heart-breaking autopsy. The skeleton ultimately went to a museum in Atlanta, while the rest of the remains were buried in a marsh. NOAA is aware of the problem, and doing its best. They’ve put regulations in place to restrict fishing in sensitive areas, reduce the amount of rope used for lobster and crab pots, and put weak links in them so that they’ll break. But the ropes are getting stronger and tougher all time, which makes them steadily more dangerous. The fishermen themselves are rather endangered, and are hard put to do the right thing. What else can be done? It occurred to me while reading the story that some newer tech might help. If people can’t get close to these whales, maybe robots could. Only $800! They’re flown by remote control and send back an HD video feed. Maybe one of these could be flown over to the whale with a cutting tool on a hook. It could snag the ropes and slice through them. If it got whacked, that would be no big deal. I wrote to Moore with the suggestion. I mentioned the quadcopter above, but thought that it might not have enough lift or battery power to handle a cutting tool. I found that Prof Molly Lutcavage of U Mass Amherst was already using them to track bluefin tuna in the Atlantic, and so might know how they performed at sea. Notice that I don’t call these things drones. That term has really bad connotations. Hear drone and you think of assassination robots in Central Asia, or of police spying. I thought that any company that makes these would be happy to get some good publicity by helping him. See, our products are used to save whales, not to blow up people! Moore wrote back to say that he was already interested in these devices. He actually has a DJI Phantom, and wants to use it for entanglement research. They’re already using similar devices in Canada to get pictures of whales from above so they can tell if they’re pregnant or losing weight – Vancouver Aquarium Uses Hexacopter Drone . He thought they weren’t quite ready to carry tools, but that could happen in a year or two. Getting FAA permission is also an issue. Woods Hole has also been working on autonomous underwater vehicles to track sharks. They used a two-meter-long AUV to follow a transponder fastened to a great white, although the shark did try to eat it: REMUS Sharkcam – the Hunter and the Hunted . Moore thought that this would be tough to use with whales, since they cruise at 6 mph, and their AUV maxes out at 5. So he was already on it! I really hope he can make some progress on this problem. In the Globe article he sounds despairing. Maybe these flying robots can do something positive, instead of reminding people of Skynet’s Terminators. This entry was posted in Uncategorized and tagged Tech life in New England. Bookmark the permalink.